No one else knows your child as well as you do, and no one ever could. You are a walking encyclopedia of your child’s history, experiences, habits, and wishes. If your child has special needs, the family’s history adds a helpful chapter to your child’s book, one detailing his unique medical, behavioral and educational requirements. What would happen if you suddenly became unable to provide your child with the necessary supports he needs? Without you, your child would become dependent on other caregivers who simply do not possess all of your personal knowledge and insight. However, there are steps you can take now to minimize the natural disruption and disorientation that will occur upon your death or if you become unable to care for your child during your lifetime. First and foremost, you should put into place supported decision making for your child to assist with personal financial and medical decisions. Depending on your child’s functioning, this is accomplished by either appointing a legal guardian through a court proceeding or having your child execute a power of attorney and health care proxy. Second, you should prepare a letter of intent to help loved ones and your child manage a difficult transition when you no longer are the primary caregiver. A letter of intent is an important planning tool for parents of children with special needs (including adult children), and also may be useful when planning for minor children who are not expected to face special challenges. Although a letter of intent can be considered one of the most important estate planning documents a parent can prepare, it is not a formal legal document that must be created by an attorney. The goal of a letter of intent is to memorialize your knowledge of your child’s needs so that you may guide future caregivers, guardians and trustees in providing the best possible care to your child. Simply put, a thoughtful letter of intent ensures that those who come after you need not waste precious time figuring out the best way to manage and care for your child. At minimum, the letter can address the following points regarding your child: family history, daily schedule; food likes and dislikes, medical care, education, government benefits received, employment, residential environment, social environment, religious preferences, behavior management, and funeral arrangements. Once you prepare, sign and date the letter of intent, you should review the document annually and update it as necessary. It is important that you let your child’s potential future caregiver know the letter of intent exists and where it can be accessed; even better, you can review the document with the caregiver on an annual basis. The letter of intent should be placed with all of your other relevant legal and personal documents concerning your child. The letter of intent can be a difficult and extremely emotional document to write, as you are envisioning a time when your child is navigating this world without you. However, once it is completed, the first important step has been taken toward creating a detailed road map for future caregivers and trustees. As a parent you also may be relieved to know that you are ensuring the highest quality of life for your child by laying the foundation for as seamless a transition as possible after you are gone. A new Application solves one of the biggest problems facing every parent of a child with special needs. How can I continue to provide for the protection well-being of my children after I am gone? How can I make sure that my child with special needs will be safe and continue receiving the best of care? Every parent who has a child with special needs seeks answers to these questions. In response, parents are advised to prepare a “Letter of Intent” that will provide guidance for caregivers into the future. However, through no fault of their own, parents are rarely able to complete this vital task. There are hundreds of constantly changing details to organize. Many parents simply don’t have the time or energy to organize the myriad of details of their child’s life, let alone putting them down on paper. Your Letter of Intent is a “road map” to guide others, so it must be comprehensive, yet easy to follow. Finding no practical tools to help format a Letter of Intent, many parents simply abandon the task. Your child’s life is constantly changing, so the document must be constantly changed. Word-processed documents are cumbersome and not easy to update (even if you can remember where you saved it!). Your updated Letter of Intent must be shared with others after you are gone. You will select different people to fill key roles over time. Mailing out updated copies yearly to different people during your lifetime is a nearly impossible task to manage. Facing this daunting task, many parents are simply frozen by “writer’s block.” How much information should I include? How much info is too much? How can I not lose it? How can I easily update the document? How can I share my Letter of Intent with the right people after I am gone? With so much to think about, there is no clear place to start. Parents will be relieved to know that an Application is now available that solves all of these problems: Vestidd. Vestidd is an application that lets parent create a Vest for a child with intellectual and/or developmental disabilities (Vest i d d). Your Vest is where you store, remember, find and connect everything and everyone that matters in your child’s life. Just like a life-vest, Vestidd will help keep your child safe and protected into the future. To create a Vest and get started on your Letter of Intent, go to www.vestidd.com to sign up. Vestidd is organized by Sections and Pockets. Sections cover each major area of your child’s life. Pockets are where you fill in specific and unique information about your child. Vestidd has pre-organized everything, so you don’t have to. You can jump right in and go. Say goodbye to post-its, binders, and email chaos. All of the information that used to be spread out across your house and your brain will now have a single home. 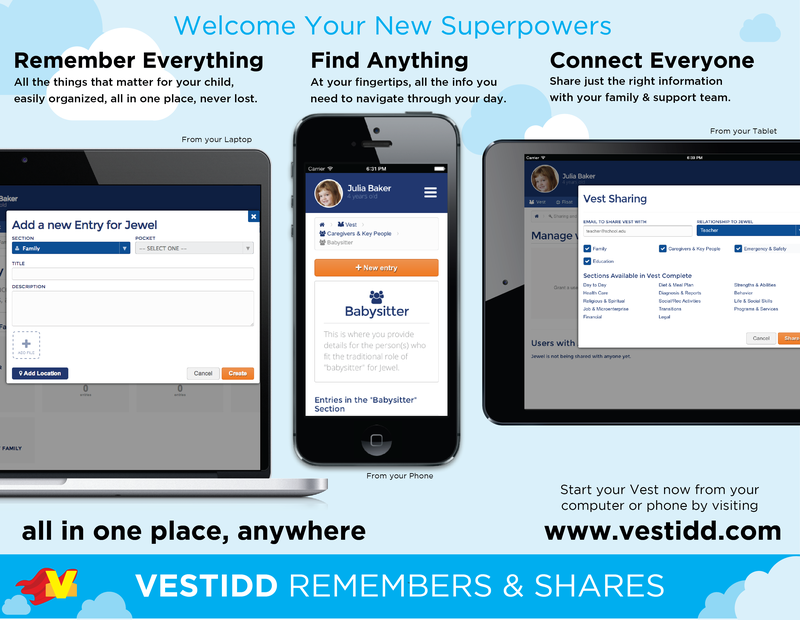 Vestidd lets you remember, find and connect everything and everyone that matters in the life of your child with special needs. Vestidd is a Cloud application that works from any device – iPhone, iPad, tablet, android, mac, pc – they all work with Vestidd. This means you can get to your Vest from any device and easily update information as the need arises. 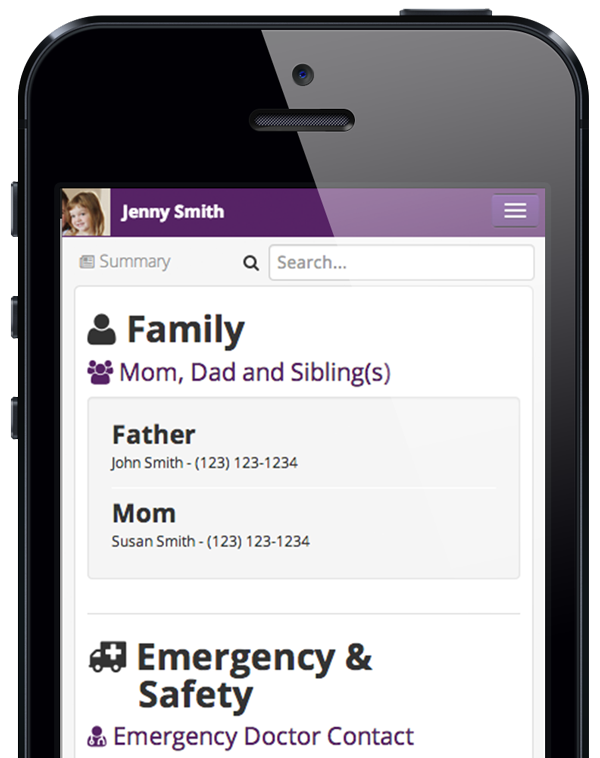 Your Vest is always there, keeping key information available at your fingertips. Vestidd lets you connect family members and your child’s support team with just the information they need. When you update your Vest, team members are kept current with automatic update notifications. You can revoke sharing privileges at any time. You can also share Vest information by printing out a hard copy. Vestidd’s sharing tools allow you to pass on current and comprehensive information about your child to future caregivers, so that they can continue to update your Vest, for your child’s lifetime. 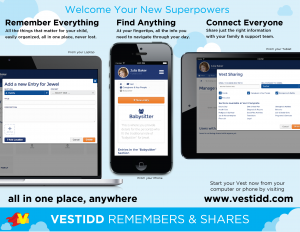 Vestidd has many other features that help families with special needs. You can take a tour and learn more at www.vestidd.com. My wife, Sue, and I created Vestidd to help parents complete the special needs planning puzzle. The Voice is the e-mail newsletter of The Special Needs Alliance. This installment was written by Special Needs Alliance member Amy C. O’Hara, Esq., and her co-author, Sheryl Frishman, Esq. 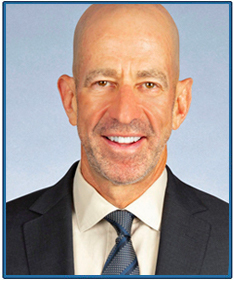 (former counsel to Littman Krooks LLP). Amy is an attorney with the New York law firm Littman Krooks LLP, concentrating in special needs planning, trust administration, guardianships, elder law, and estate planning and administration. Amy is an active participant of the Special Needs Alliance publications committee and is a member of the New York State Bar Association. Sheryl’s practice is devoted entirely to the advocacy and life planning needs of children and adults with disabilities and their families. She is immediate past President of the Board of Directors of Westchester Arc. Sheryl also serves on the Board of Governors and Legal Committee of NYSARC Inc.
First and foremost, you should appoint a legal guardian for any child who is not expected to be able manage personal financial or medical decisions without assistance. Second, you could prepare a letter of intent to help loved ones and your child manage a difficult transition when you no longer are the primary caregiver. A letter of intent is an important planning tool for parents of children with special needs (including adult children), and also may be useful when planning for minor children who are not expected to face special challenges. Although a letter of intent is one of the most important estate planning documents a parent can prepare, it is not a formal legal document that must be created by an attorney. The goal of a letter of intent is to memorialize your knowledge of your child’s needs so that you may guide future caregivers, guardians and trustees in providing the best possible care to your child. Simply put, a thoughtful letter of intent ensures that those who come after you need not waste precious time figuring out the best way to manage and care for your child. Family History: Where and when you were born, raised, and married, including anecdotes about your own siblings, grandparents, and other relatives or special friends. A description of your child’s birth and his connections to specific family members or friends will complement your account of favorite memories and feelings about your child. General Overview: A brief summary of your child’s life to date and your general thoughts and hopes about the future for your child. Daily Schedule: Because levels of functionality vary for each child and future caregivers may fail to recognize this fact, it is important to include a list of your child’s daily routines, favorite activities, and events or tasks he loves or hates. Because a child’s ability to contribute to even the most mundane aspects of family life builds self-esteem, it is important that the letter mention whether your child can help with tasks like doing the dishes or raking leaves. Alternatively, if your child loves “swiffing” the floor but folding clothes frustrates him, make sure future caregivers have this information. Food: Describe your child’s diet, including his favorite foods and any specific manner in which the food should be prepared or served. Be certain that the letter also includes a list of foods to which your child is allergic, simply does not like or otherwise may react adversely due to medication. Medical Care: Describe in detail your child’s disability, medical history and allergies, as well as current doctors, therapists and hospitals. Detail the frequency of your child’s medical and therapy appointments and the purposes and goals of these sessions. List current medications, including how they are administered and for what purpose, and be careful to describe all medications that have not worked for your child in the past. Education: Detail your child’s educational experiences and describe your desire for your child’s future education, including regular and special classes, specific schools, related services, mainstreaming, extracurricular activities and recreation. Discuss your wishes regarding the types of educational emphasis, i.e., vocational, academic or total communication, and name any specific programs, teachers, or related service providers that you prefer to be part of your child’s overall life plan. Benefits Received: List the types of governmental benefits your child receives, including Medicaid, Medicare, SSI/SSDI, Supplemental Nutrition Assistance Program (food stamps), and housing assistance. Detail the agencies’ contact information, identification numbers for your child’s case(s), the recertification process for each benefit, including important dates and other reporting requirements. Employment: Describe the types of work and work environments your child may enjoy; i.e., open employment with supervision, a sheltered workshop or an activity center. List any companies of which you are aware that provide employment in the community and may be of specific interest to your child. Residential Environment: Describe your child’s living arrangements with family, friends or other organizations. If your child will be unable to continue living with these individuals after you stop being the primary contact for his care, describe what you consider to be the best alternative arrangements. For instance, explain whether you prefer that your child live in a group home or institution located in the same community, the preferred size of the institution, or that your child have a single room or roommate. Social Environment: Mention the types of social activities your child enjoys, i.e., sports, dances, or movies. Indicate whether your child should be given spending money and, if so, how he has spent money in the past. 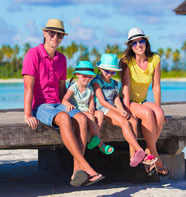 The letter of intent also should note whether your child takes and/or enjoys taking vacations and, if so, whether he has a favorite travelling companion. Religious Environment: Specify your child’s religion and any local place of worship your family attends. List all local clergy that may be familiar with your child and your family. Describe your child’s religious education and indicate whether this is of interest to your child. Behavior Management: Describe any current behavior management program that is having a positive impact on your child and discuss any other behavior management programs that were unsuccessful in the past. Final Arrangements: List your desires for your child’s final arrangements, including whether you have planned for a funeral, cremation or burial, and any cemetery, monument, religious service or specific clergy to officiate the proceeding. Other Information: Include any other information that you believe will provide the best possible guidance to the person who assumes responsibility for caring for your child. The letter of intent can be a difficult and extremely emotional document to write, as it often is the first time parents actually envision their child with special needs navigating this world without them. However, once it is completed, the first important step has been taken toward creating a detailed road map for future caregivers and trustees. As a parent of a child with special needs, you also may be relieved to know that you are ensuring the highest quality of life for your child by laying the foundation for as seamless a transition as possible after you are gone. Reprinted with permission of the Special Needs Alliance – www.specialneedsalliance.org.